Murder by Gaslight: Fanaticism and Murder. The Cause of the Murder of the Family Near Dayton, O.
Cincinnati, March 11. – Further particulars in regard to the murder of a woman and three children, near Dayton, Saturday night, indicate the murder was committed by the father, Leonard Marquardt, who is evidently insane from a spiritual cause. The story the man himself tells is that a few days ago he read a chapter to his family from the Bible, and then rising up, accused his wife of being a witch and using witchcraft. He says his eldest daughter confirmed him in his suspicions. He says also that on Saturday night he told his wife he wanted their children to leave; then he and his wife stripped naked, and knelt down and prayed for fifteen minutes. They then stripped two of the children and took them out and drowned them and laid them side by side on the bank of the stream. They then dashed out the brains of the infant and left it in the woods, after which they returned home and went to bed. After lying there for fifteen minutes he told his wife that he wanted to send her to heaven also, and immediately fell upon and strangled her to death. After that he arose and prayed until three o’clock in the morning, when he went to the nearest neighbor and told him the whole story. Marquardt is a Germen farmer, and has been in this country about eighteen years. The murdered woman was his second wife. "Fanaticism and Murder." 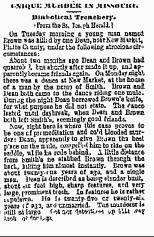 Wooster Republican, 14 Mar 1872: 2. The Land of Undiscovered Murders.